A D JAMESON: If I remember correctly, we met in 1998 or 1999. 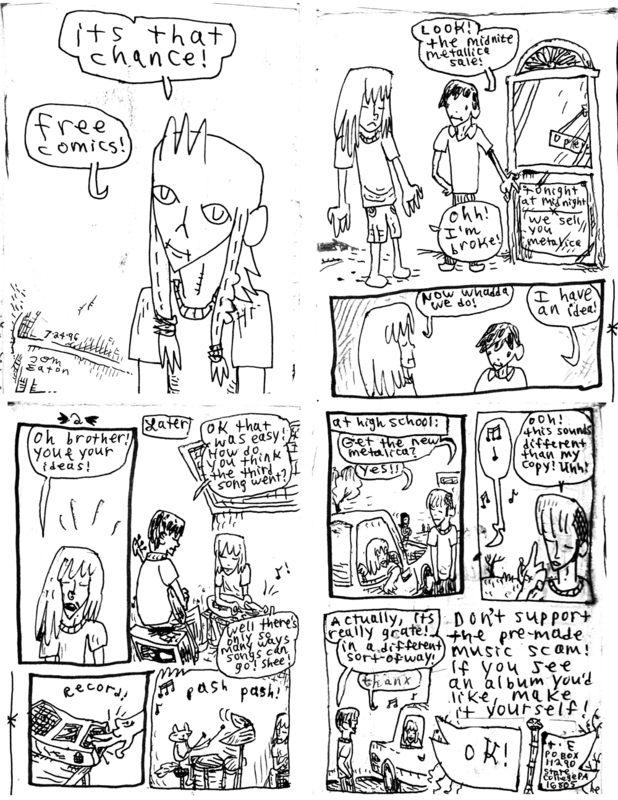 I had just graduated from Penn State, where I’d found some of your minicomics at Comic Swap. I enjoyed them tremendously! TOM EATON: I’m so glad you enjoyed them. You must have been the target audience. I put them out at Comic Swap, and some of the record stores. ADJ: I remember specifically finding the Valentine’s Day one, right around Valentine’s Day. ADJ: And then I tracked you down, even though you’d graduated a year or two ahead of me—maybe we had friends in common? Did you know Melissa Hsiung and Maureen Mahr? TE: I did know Melissa, and David Grainger too was another friend we had in common. TE: Yes! At Penn State, he and I did a lot of music recording together. ADJ: But how did we actually get in touch? Did you put your email address on the comics? TE: Yup, you emailed me, it was on the comics. ADJ: And you invited me to a party at your apartment in Queens. TE: A dinner party. It was in my small studio apartment, with an animation light table laid flat as one of the dinner tables. TE: It’s really sad that flying erase heads were once enviable. I’m so grateful for the digital revolution. When I started in animation, digital production was fairly new. I remember realizing that all these things that cost so much money to do could now just be done at home for free (such as, renting time at a video editing suite). ADJ: I had a similar experience the first time I used Sound Forge, and realized that recording effects that once took weeks to create on tape could be accomplished in minutes. I don’t think I told you then that I was living in Eatontown, NJ. So I thought it destined we should become friends. TE: I don’t remember that. I lived in Jersey myself for a year before moving to Queens. I’m sure I would have enjoyed living in a place called Eatontown. ADJ: I’m sure you wouldn’t have. And your party, by the way, was my first time in Queens. I was going to Manhattan and Brooklyn a lot back then, but hadn’t been to any of the other boroughs yet. TE: That must have messed with your view of Queens. It’s not all animator dinner parties and flying erase heads, you know. ADJ: Oh! No, I didn’t. TE: It’s true. Nas has rapped on that very subject. ADJ: What took you to New York after Penn State? Why didn’t you want to stay in dear ol’ State College forever? TE: I came to New York with dreams of working in animation. 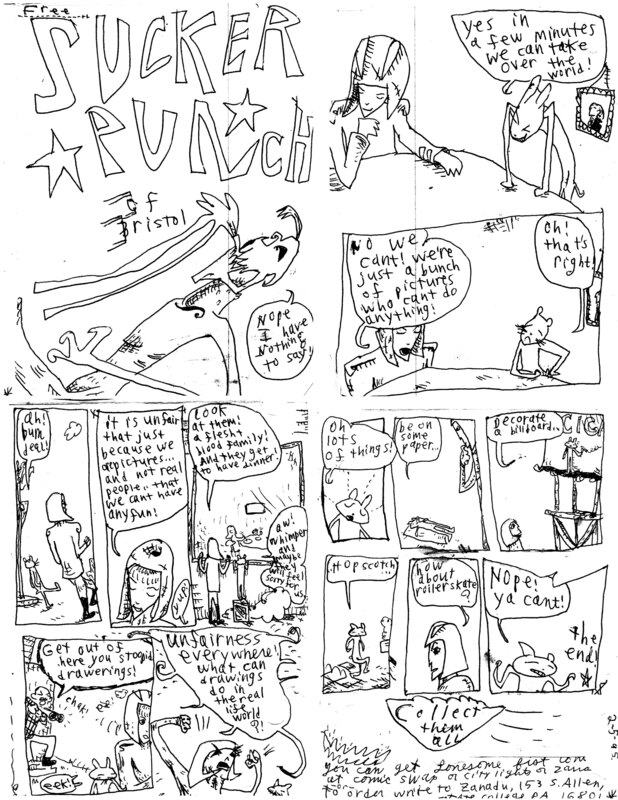 I loved drawing minicomics, and had always loved making animation…but beyond that, wasn’t exactly sure how it would all work. At that time, MTV Animation was a major employer—I think both Beavis and Butthead and Daria were being produced here then, and Nickelodeon was producing Blues Clues, and there were a number of smaller studios around the city…so there were possibilities. ADJ: Is that what you studied at Penn State? TE: No, I was an English major! Toward the end of my time there, I took PSU’s one animation class. Luckily enough for me, they had an Oxberry camera, which is what was used to shoot traditional animation and movie credits back in the day. It was awesome (in an exhausting kind of way) to use one of those while they were still around. ADJ: Did it have a flying erase head? TE: No. I don’t think anything flew on that camera. It was a large, cumbersome machine, controlled by an antiquated computer on which you could program frame-by-frame camera moves. I’m glad to have used it—it’s good to be able to describe to my animation classes the pros and cons of the old technology. Mike Podolski was the teacher, and I still remember/repurpose his lessons in my own classes. ADJ: So that’s what made you move to NYC? TE: Yup, that brought me here. My first opportunity was the winter break before graduation, interning for the fantastic designer/animator Graham Elliott. You can get a sense of his wonderful hyperkinetic style here. His studio, Cat and Crossbones, was like one of his music videos come to life—found objects and mechanisms and power tools stacked in shelves, all to be combined into stop-motion/mixed media animations (some of which involved people, puppets, sparklers, hand-drawn art, etc.). He was very generous about letting me do things—I got to do some paint-on-glass animation for a TV spot, and figured out how to get an old Amiga computer do motion tests. It was very inspiring—such a great mix of the handmade and everyday mashed together with a playful artistic eye. ADJ: Are you still in touch with him? TE: Yes. I recently worked on a Havaianas spot for him, and that piece has many of those trademark techniques that I love so much. TE: It just keeps coming up! This was for his Nickelodeon series The Offbeats, at the studio Curious Pictures. It was such a great education in traditional animation. Mo was very generous in showing me and the other artists the nuts and bolts of cel animation and storytelling. There were so many other projects going on all the time too, so you could try a little bit of everything. I animated a pencil test for a stop-motion Play-Doh commercial, created paint-on-glass animation and later on did Flash and After Effects animation there. ADJ: Are any of the older works online? TE: Kind of: The paint-on-glass piece (backgrounds) are here, in shakey, hand-held cam form (at 11:30). ADJ: Were either of these guys at that dinner party? TE: No, they weren’t. No big shot directors in attendance. ADJ: I don’t remember much about that party, besides the animation you showed us, and the fact that you gave me the minicomics I was missing. And which I still have, although they’re at my parents’ house. TE: Hopefully your parents have been enjoying them! ADJ: I did put them out on a bookshelf, and encouraged my parents to read them (along with other things). But then my dad turned my old bedroom into a study, and packed up all my books and put them in a crawlspace. You’re in a crawlspace! TE: Ah, the crawlspace. Home to many an old comic book. TE: I do love a good catchphrase. ADJ: Returning to those comics, your Metallica cover-album minicomic, if nothing else, deserves to be legendary. TE: Wow, thanks! It was a reaction to midnight album release hype, which certainly dates it. Rather than buy the album, how about taking your best guess at what it sounds like and doing it yourself? The true DIY spirit. ADJ: “Don’t support the pre-made music scam!” Brilliant! TE: More recently, the Dirty Projectors recorded that Black Flag album they recreated from memory. What can I say—that comic was very prescient. ADJ: I actually thought of you, when that album came out. TE: Really! I like that album quite a bit. ADJ: Me, too. Have you heard Metallica’s recent collaboration with Lou Reed? TE: I saw a video of Metallica backing him up on “Sweet Jane.” It seemed like the musical equivalent of a caffeinated alcoholic beverage. Aggressively aloof. ADJ: It’s completely “experimental.” Speaking of which, I was really into experimental cinema in those days. Did we talk at all about that? TE: I don’t know that we did. I don’t really know much about experimental cinema, although I’m sure I would have liked to at the time. TE: Thanks! “You know more about indie rock” is what every good music snob likes to hear. ADJ: As I recall, you were somehow involved with the Danielson Famile, right? How did that come about? TE: A friend played me their first album and said, “You’ve got to hear this, it’s awful.” I immediately loved it. ADJ: I had a similar experience when I heard them, although the friend who recommended it also loved it. TE: They’ve been known to be pretty polarizing. Inside the album cover was a note saying that they’d send you the lyrics if you mailed them a gift. I sent my minicomics, and Dan & I began corresponding by mail and met at shows. I got to know them much better after moving to NYC. ADJ: How much better? Didn’t you actually play with them, at some point? TE: Much, much better! I met Dan at his very first record release party—his father opened, and performed his songs with a slideshow in the background of the family going camping and canoeing—fantastic! The fact that he chose to make his rock & roll debut like that was awesome and very original. 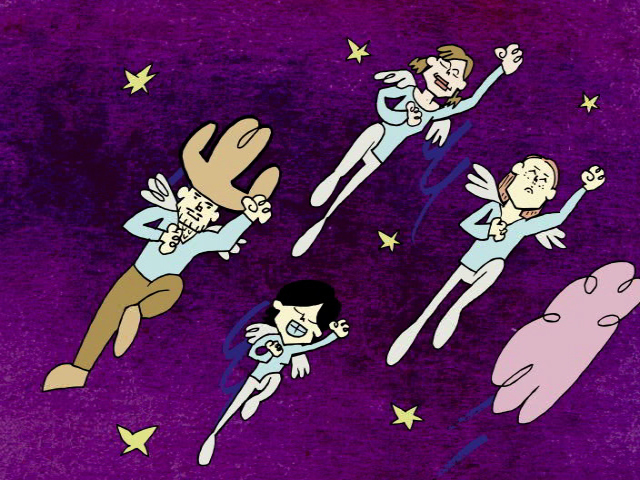 But through Sufjan and his friends who put together Danielson shows in New York, I saw them a lot more often. I also animated a video for their retrospective album, Trying Hartz (2008), called “Idiot Boksen,” which addresses the evils of television. ADJ: And somewhere in there you started working for the Cartoon Network, specifically for the show Codename: Kids Next Door. How did that happen? 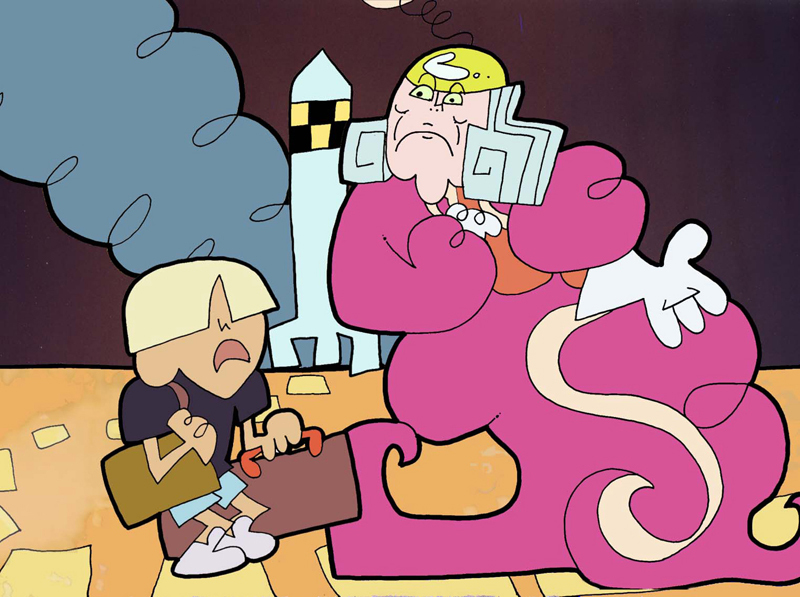 TE: I worked on Sheep In The Big City, Mo’s show for Cartoon Network, and when that production wound down, much of the staff started on Kids Next Door. ADJ: I taped one of the episodes, at my parents’ house, because you’d written it. And I watched it. I don’t remember which episode it was, though. TE: It was one about a character named Lasso Lass. The idea was that she used to be in a kids club much like the Kids Next Door, only now she was grown up, and didn’t realize it. I was proud of the premise, though that was her one and only appearance. Alas, Lasso Lass. ADJ: Do you have the rights to the character? ADJ: Do you still work for that show? Or for the Cartoon Network? TE: No. I’ve worked on other shows since then—such as Little Einsteins (on the Disney Channel.) Lately I’ve been teaching animation at two CUNY colleges. ADJ: I fell into teaching, too. Adjuncting. Then I fell back into grad school. TE: I enjoy it a lot. I like the independence and challenge of putting a class together. I also love showing people how to do things—especially something as creative and with as much universal appeal as animation. My fellow animation teacher Nina Frenkel and I have said that teaching animation feels almost evangelical—particularly when you’re passionate about the medium. Most people love learning how to do it. It unlocks all kinds of creativity in just about everyone. I’ve taught all age groups at this point, from kids through senior citizens, and it’s super inspiring to see what they all come up with. ADJ: When I returned to the US in 2005, and moved to Chicago, you sent me a DVD with some animations you’d done. I remember one in particular, “Thinking Cap World,” which was voiced by Sufjan Stevens. How did you meet him, start working with him? TE: Sufjan went to Hope College with my brother, who put us in touch based on our mutual interest in Danielson. Sufjan and his roommate Melissa were booking the Danielson Famile to play at their shows and art happenings in New York. Later, Sufjan started playing his own small Christmas concerts downstairs at the Knitting Factory, and enlisted friends to be his backup band, so I trumpeted for him. Later I asked him to record a voice for that cartoon in the same session that I trumpeted on Michigan (2003). It seemed like a fair trade. I also made the video for his song “Put The Lights on the Tree” (2006), which was included in his Christmas box set, with matching comic strip and advent calendar! ADJ: I wasn’t aware of those. I moved to Chicago right when Illinois came out, so I adopted it as my personal special album. Although I guess I wasn’t alone in doing that. TE: It’s a great album. I heard “Chicago” being played at a Key Foods in Brooklyn once, which was a surprise. Then again, these grocery stores in Brooklyn are very in the know. I sent you “Thinking Cap World” because you were having film screenings in your apartment, if I remember correctly. ADJ: Sort of. I think it was because I started and co-ran a film club at ISU, with my good friend William Barker. We screened stuff in a lecture hall there. TE: Kind of like with the minicomics in college, I’ve always liked the idea of being able to find something cool in a small, obscure venue—so I sent you those cartoons for your screening series. ADJ: Right. Although by that point, the film club had been shut down, by New Yorker Films. TE: Really?! Why was that? Personally, I think it was all very silly. We showed obscure videos to rooms of 5–7 people—“we” being a licensed school club using a classroom, and advertising the screenings as being educational—and they wanted thousands and thousands of dollars. When they really should have thanked us for promoting their stuff. We totally increased demand—people who missed the screenings often then rented the videos. But that’s all water under the bridge. And New Yorker—or that version of it, at least—went out of business; that’s karma. And I did show “Thinking Cap World” to my Chicago roommates at the time, on our living room wall (though that building was later torn down, to make way for a condo). Meanwhile, did you show your work at any other festivals? ADJ: I would have, but I didn’t know about it! TE: Right? That idea of discovery is different now with the internet, where everything seems to be available at all times. It seems unfortunate on one hand, since there’s something infinitely charming about discovering a self-produced vanity record or oddball comic book in the corner of a shop that you just don’t get online. Maybe it has something to do with the effort and commitment that goes into making a physical artifact. On the other hand, there are still plenty of obscure wonders on the internet, and it’s great that more people get to find them. This will probably all turn into a very passionate antiquing hobby. It’s a slippery slope. ADJ: It is somewhat unfortunate how easy the internet has made it to find some things. For instance, there are some books I’ve wanted for years, and I know I could order them online, but I continue to hold off, preferring to look for them in used bookstores. TE: I have a few things like that. I’d like to find Mike Allred’s Golden Plates comics in person. ADJ: But, yeah, there will never be any shortage of obscure things. Or film festivals. Anyway, you and I lost touch after that, although I’m not sure why. Was it just life? TE: It must have been life. Or, did you really not like Queens? ADJ: I loved Queens! I don’t know why I didn’t come visit you more. I guess I was shy. I went into NYC a lot in those days, mainly to attend Astria Suparak’s Pratt film series. That’s what inspired me to start the ISU club. But I moved to Illinois in 2000. So I would have only been able to visit you for two years or so. Still, I’m sorry I didn’t. ADJ: No, I don’t think so. I had him come out to read at ISU, though. I distinctly recall that I invited you to attend that event, but you failed to show. ADJ: Now you’re working on a web comic, about a man who can zap bugs? ADJ: It’s very appropriately named, then. I clicked through and read them all recently. How’d that series come about? 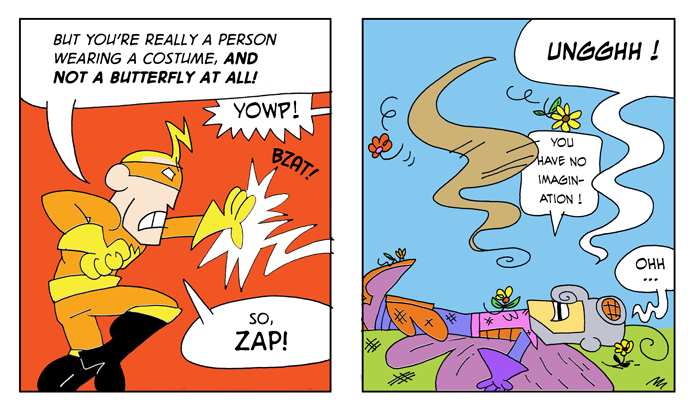 TE: I’ve been teaching kids comics classes recently, and developed the Bug Zapper as an example superhero to get the kids thinking of their own heroes and villains. I decided to develop it into an ongoing story online, and update it once a week. It’s fun, plus a good motivation to stick to a deadline. I’m also enjoying creating a longer format story. Making animation has been helpful in that it encourages you to really think through and streamline your storytelling. You’ve got to commit a bit more than with comics, because you’re sinking so much time and energy into it. 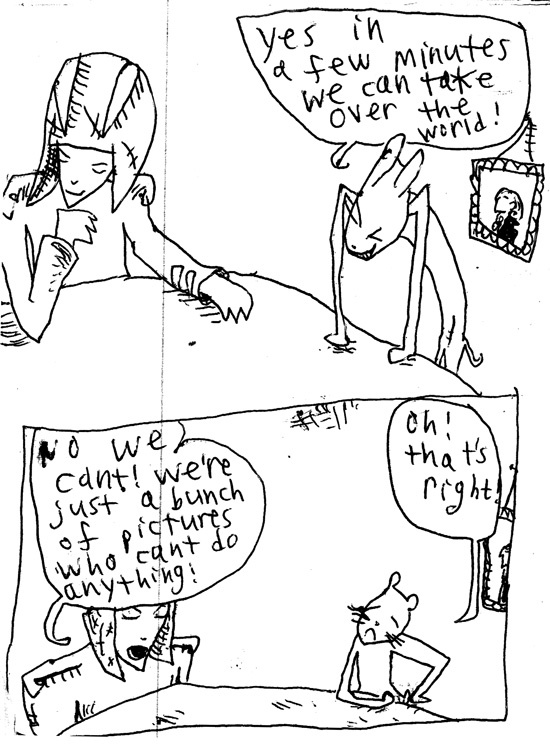 But I like returning to comics too, and not having to animate everything. It’s probably healthy to do both. ADJ: Also, you’re pretty active on Tumblr. TE: In doing class prep, I’ve come across a lot of great films and art—more than there’s time to include in class. So I like having this other outlet for thoughts and new art and online discoveries. Recently I came across a documentary on cut-paper animation legend Lotte Reiniger. I’ve taught about her techniques every semester, so to come across footage of her actually working is unbelievably cool. Why keep it to yourself? ADJ: Ah ha! So you do like these new technologies! TE: I do! I sometimes miss the photocopied comics heyday—but the new technology is pretty nice. Especially when it comes to animation, where production costs were prohibitively expensive. 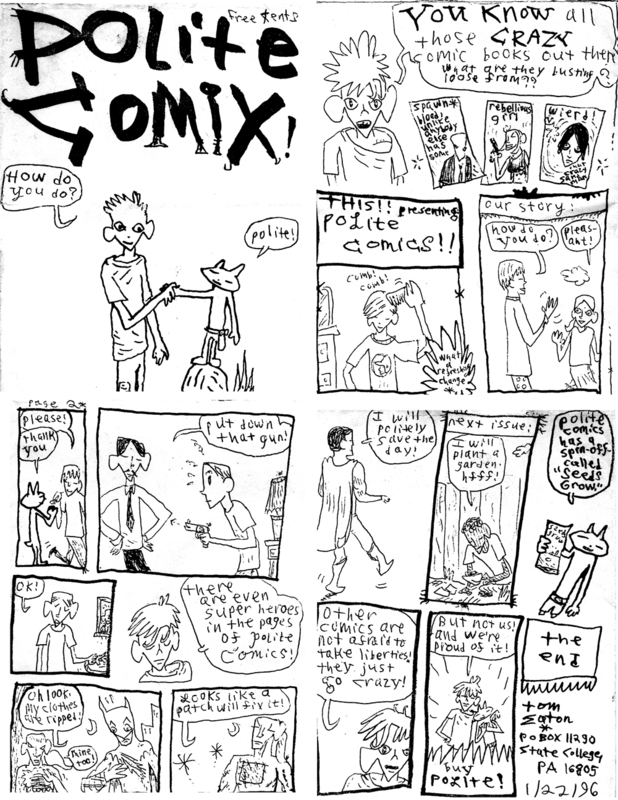 It’s fantastic to now get to hear new voices/see new styles for just that reason—and that’s certainly in keeping with that DIY minicomics spirit.